Instrumental temperature recording in the Greater Alpine Region (GAR) began in the year 1760. Prior to the 1850–1870 period, after which screens of different types protected the instruments, thermometers were insufficiently sheltered from direct sunlight so were normally placed on north-facing walls or windows. It is likely that temperatures recorded in the summer half of the year were biased warm and those in the winter half biased cold, with the summer effect dominating. Because the changeover to screens often occurred at similar times, often coincident with the formation of National Meteorological Services (NMSs) in the GAR, it has been difficult to determine the scale of the problem, as all neighbour sites were likely to be similarly affected. This paper uses simultaneous measurements taken for eight recent years at the old and modern site at Kremsmünster, Austria to assess the issue. The temperature differences between the two locations (screened and unscreened) have caused a change in the diurnal cycle, which depends on the time of year. Starting from this specific empirical evidence from the only still existing and active early instrumental measuring site in the region, we developed three correction models for orientations NW through N to NE. Using the orientation angle of the buildings derived from metadata in the station histories of the other early instrumental sites in the region (sites across the GAR in the range from NE to NW) different adjustments to the diurnal cycle are developed for each location. The effect on the 32 sites across the GAR varies due to different formulae being used by NMSs to calculate monthly means from the two or more observations made at each site each day. These formulae also vary with time, so considerable amounts of additional metadata have had to be collected to apply the adjustments across the whole network. Overall, the results indicate that summer (April to September) average temperatures are cooled by about 0.4°C before 1850, with winters (October to March) staying much the same. The effects on monthly temperature averages are largest in June (a cooling from 0.21° to 0.93°C, depending on location) to a slight warming (up to 0.3°C) at some sites in February. 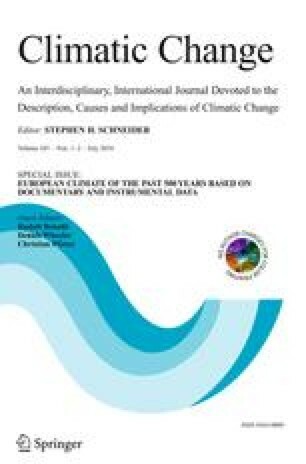 In addition to revising the temperature evolution during the past centuries, the results have important implications for the calibration of proxy climatic data in the region (such as tree ring indices and documentary data such as grape harvest dates). A difference series across the 32 sites in the GAR indicates that summers since 1760 have warmed by about 1°C less than winters.